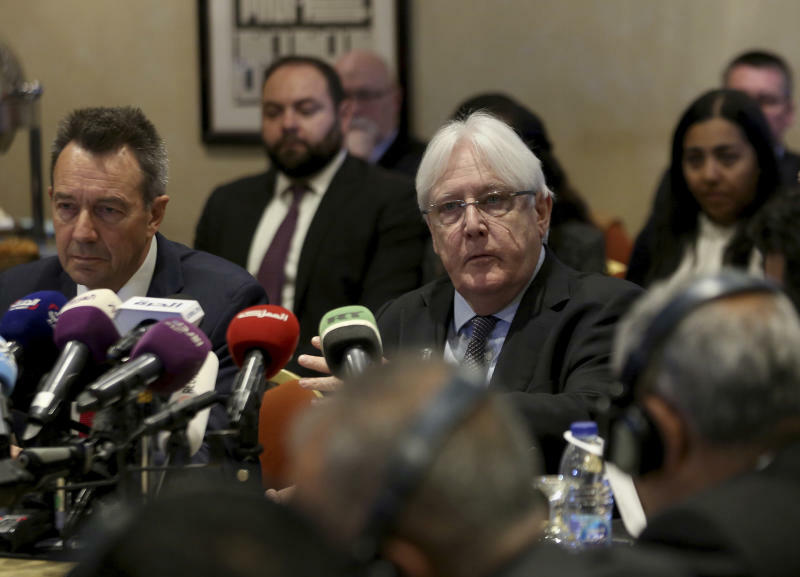 SANAA, Yemen (AP) — U.N. envoy Martin Griffiths arrived on Sunday in the capital, Sanaa, to discuss the "complex situation" in and around the key port city of Hodeida, Yemeni security officials said. The Houthi rebels said their leader, Abdul-Malek al-Houthi, met with Griffiths to discuss the implementation of peace deals from December talks with Yemen's internationally recognized government. In Sweden in December, the two sides agreed to confidence-building measures, including to a cease-fire in Hodeida and the exchange of thousands of prisoners. But the implementation of those deals has been slow and marred by violence. Separately, Yemeni security officials said a bout of fighting between Houthi rebels and tribal fighters in the northern province of Hajjah has killed more than 85 combatants in the past two days. The officials said weeks of fighting has displaced dozens of families from the Hajour tribe in the Kushar district in Hajjah. They say the tribe sought help from the Saudi-led coalition backing the internationally recognized government in the fight against the Houthis. The coalition bombed the rebels who sieged the district, the officials said. Yemen, the poorest Arab country, plunged into civil war in 2014, when the Iran-backed rebels captured the capital, Sanaa. The Saudi-led coalition intervened a year later. The fighting has taken a terrible toll on civilians, with thousands killed amid a catastrophic humanitarian crisis. Millions suffer from food and medical care shortages and the country has been pushed to the brink of famine.